LED is the short name given to a light-emitting diode (LED). Light-emitting diodes are semiconductor devices that convert electricity to light by using the movement of electrons. The chemical compounds used within the LED determine its colour, brightness and power efficiency. They were invented in Russia in the 1920s and put into practical use in the United States in the 1960s by General Electric. In the late 1960s, Monsanto Corporation was the first to mass-produce LED’s, and Hewlett-Packard used them in its early calculators. There are many consumer advantages to LED’s over traditional incandescent or fluorescent light bulbs. LED’s have no filaments that can burn out or fail. LED ‘s consume much less energy: they are 300% more efficient than compact fluorescent lights (CFLs) and 1,000% more efficient than an incandescent. They have a very long life and high reliability, with about 100,000 hours of use at 70% of their original power. This works out to 24 hours a day for 11 years at 70% power. A typical 60-watt incandescent bulb may last about 1,000 hours. LED lighting contains no mercury or other toxins. The bulbs emit no ultra violet (UV) light, so they don’t attract bugs. The small bulbs don’t generate much heat, so they are cool to the touch. They don’t generate radio frequency waves, so they don’t interfere with radios or television broadcasts. LEDs also are resistant to vibrations and shocks. How is LED different to other forms of Digital Signage? Digital signs use many different technologies such as LCD, LED and Projection to display their content. Each of these technologies has its strengths and weaknesses and given these attributes each is better suited to certain scenarios. LED signs are perfect for outdoor applications. They are extremely bright (even in direct sunlight), durable and their relatively poor close up resolution makes them perfect for applications where the signs are to be viewed from a distance. Pixel is a word invented from “picture element”. It refers to the basic unit of programmable colour on a LED sign. Think of it as a single point of light which when multiple pixels are illuminated together can form letters, pictures and video. A pixel can be made up of a single LED or multiple LEDs of different colours. Pitch refers to the distance between two pixels. Generally speaking, the smaller the pitch (the space between the LED’s) the better and more readable the sign is from close up. LED signs with smaller pitches are referred to as being higher resolution which means whatever is being displayed will look crisper and more detailed. A rough guide to minimum viewing distance is 1 metre per millimetre of dot pitch. I.e. a sign using P20 dot pitch is best view from 20m or more. A sign using P10 dot pitch is best viewed from 10m or more. Who makes Milestones LED Modules? We source our modules from a Chinese company. The Company was formed in 2005 which for this type of technology was pretty much at the inception. The owner of the company is the original developer of the product. He was an electrical engineer working in the field when he got the idea for his design. It took him several years of working after hours to perfect the design and refine it to the product you see today. He then left his employment to start the company. They now have two divisions with approximately 200 employees. Where are these signs used and how do they fare in Australian conditions? The average running cost depends on a number of factors such as sign type (colour and pitch), the overall size, the daily duty cycle and the power cost in your State. As an example a mono red, 2.4m wide and 0.96m high, 10mm pitch sign running daily for 18 hours in NSW would cost approximately $100.26 per year to run. The same sign in Victoria would cost $89.99 per year to run. Electricity price based on Average Annual Price Tables published by AEMO 06/2014. Can the signs be run on solar power? No, “off grid” solar is not really an option yet. Generally speaking it’s expensive to setup, requires ongoing maintenance (and expense) and is not necessarily as ecofriendly as people would have you believe. You need somewhere nearby to house the batteries, inverter, regulator etc. When you compare all this to about $100ex per annum for normal “on grid” power its usually a fairly straight forward decision – even if in some cases the initial capital outlay for getting power to the sign seems expensive. Are the modules supported from within Australia? Can they be serviced and any faults will be rectified on site? Yes, they are supported here in Australia by a third party maintenance company. We carry spare modules and controller cards. Any faulty component can be easily cold swapped on site. Is there technical competence in Australia? Yes. Our technicians are factory trained. Having said this, anyone on your staff should be able to service the units. The primary level of maintenance is to cold swap the damaged/faulty panel which involves removing 4 screws and undoing 4 cable connections (all of which cannot be confused as they are keyed to only fit one way). Once cold swapped, the damaged/faulty item will be repaired by our service technicians here in Sydney or they can be sent back to the factory. Does the sign have an embedded processor? Can it be repaired onsite? The sign uses a modular architecture whereby the LED panels and the controller are separate units which makes both diagnosis and repair easier. A new controller can be cold swapped on site in minutes as can the LED panels. The controller card is around the same size as a PC video card (about A5 size). Software. What software is used and what is the process for updates? Although our LED modules can use any of several generic LED control cards and software suites, we use and recommend the Xmplayer software. The beauty of using generic software means you are not stuck with proprietary software made by the sign manufacturer (as is the case with some other types of signs). This means the software is more likely to be updated in response to industry advances, rather than the advances (or lack thereof) associated with just that one manufacturer. Updates to Xmplayer are available via the web. Are the signs completely weather proof? Yes The front of the modules are IP66 rated and the rear IP65. Service requirements for sign. Access from front or rear? As the modules are sealed, the sign does not require any maintenance other than the occasional wash down to get rid of bugs that might like to call it home. Both front and rear access are available but in most cases we standardise on front access. Is a temperature sensor included or available for the display? Yes, a temperature and ambient light sensor are both available for a small additional cost. There is also a speed sensor for traffic applications. How are content updates handled. Remotely? Local or overseas? This depends entirely on your network. The sign appears as a normal device on your network, so as long as your network allows remote access then yes, you can perform updates from anywhere. Do the modules support Multi pane/frame functionality? Yes. The software is a little like PowerPoint in that you can define areas on the screen for different objects, such as text, time, pictures movies etc and you can have them all running at the same time on the same screen. Does the sign have self-diagnostics? Yes. It runs a diagnostic on boot up and will auto restart after a power failure. Does the sign have the ability for scheduling messages? Yes. This is a fundamental feature which also includes items like scheduling the on/off times, the high/low brightness times and even re-starting the controller. Does the software have an event counter display? Yes. It has both a count up and count down timer. Is the sign able to display graphic picture images? Yes and other popular multimedia formats such as Flash, QuickTime, WMV and MPG..
How good is the colour resolution? The modules have very good colour resolutions. Mono screens have a grey scale of 65536. In colour 48bit mode its 280 Trillion colours, in 24bit mode its 16.7million. Our standard warranty is for 3 years and covers all parts and labour associated with the repair of the modules. It does not cover the removal or replacement of the modules from the sign, freight or other associated costs such as scaffolding or other lift equipment should it be required. In some applications we have offered extended warranties of 5 years. What is the expected life expectancy? How do you stop cracking and distortion of the LED’s? Use good quality LED’s! We use Epistar LED’s made in Korea, one of the worlds largest producers. They make a very good and consistent product that is not known to crack or distort. What is guarantee on LED pixel failure? If any pixel stops functioning the module will be replaced under warranty. Outside of warranty will incur a service charge. Is there any degrading in LED chip in higher temperatures? Yes. 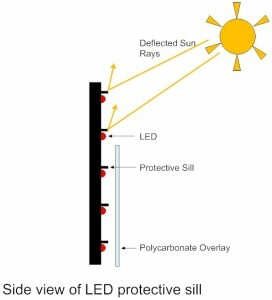 All LED’s will suffer degradation in higher temperatures. This is an inherent characteristic of ALL LEDs. We don’t have any specific data on this because each LED manufacturer makes their own claims and it can vary from one LED production batch to the next. We do have anecdotal evidence of a customer who replaced a LED module after 2 years and they found minimal colour difference between the new and the old modules. How long before the sign degrades to 90% which is the point at which the sign in now longer brilliant? We have no specific data on this as this depends a lot on intensity settings, duty cycles and environment. The sign can be programmed to dim anywhere from 0% (fully bright) to 100% (off), and then you need to look at the duty cycle – how many hours per day is the sign on, and finally the operating environment (see 20.). The half-life (50% brightness) of the EPISTAR LED’s is given as ≥ 100,000 hours (=15yrs @ 18hr/day). One thing to be aware of is that the degradation is not linear, so they will degrade more in the early years and less in the later years. Are the modules ventilated by fans? Yes, and we go one step further, they are thermally activated, so they don’t just run all the time which prolongs the life. What is the expected life of the fans? How is service and maintenance carried out? All minor servicing and maintenance can be done on site. Any electronic component failure is usually done at a service centre once the module in question has been swapped out. Is there certification for the installation of the sign? No, there is no certification on the install. We use licenced trades people working within local building regulations. They have current and valid Workers Compensation and Public Liability Insurance. They also have a current SWMS (safe work method statement) which we can give you a copy of. The product itself has CE, CCC, FCC, ROHS and ISO9001-2000 certification. How vandal proof are the modules? LED’s are fairly rugged in their own right however like most electronic devices they can be damaged. Each LED in our modules is protected from both the sun and impact damage by a small protective shade sill that protrudes past the LED. As an added protection we place a clear polycarbonate overlay over the LED surface which disperses the force of any object hitting the sign across a wide area reducing the possibility of impact damage. Graffiti can usually be cleaned off the polycarbonate and scratches usually don’t affect the viewed image. In the worse case the polycarbonate can be replaced. The diagram below shows the profile of our typical LED panel. Is there a Service/Maintenance Agreement available? Yes. it will vary from site to site but you can expect to pay under $500 plus parts for an optional preventative maintenance call. This would be a typical inspect, clean and replace any suspect parts scenario. Alternately you could look to a break/fix scenario at our standard hourly charges plus parts. Can I upgrade my sign at a later date? Yes you can. This is the beauty of our modular panels. You can replace modules easily to upgrade from mono to colour (or visa versa), or to go from one pitch or brightness to another. To make your sign bigger or smaller we just modify your existing frame and either add or subtract modules depending on your requirements. In many cases we can minimise the costs of upgrading by offering a trade in discount on old modules. The Xmplayer Software is used to control your LED sign. To get an upgrade click on the download link, send us an email request or phone us. The ITTV Software is used to control your Digital Signage network. This powerful management software can be installed on any PC or laptop computer, and provides a user-friendly tool to plan the play-list for each media player or group of media players. A drag-and-drop ‘wizard’ based, scheduling, uploading and previewing interface enables the easy delivery of play lists and content. The Media Player Control Software offers precise scheduling of each clip/message or group of clips, and supports the design of scroll text banners with as many messages as desired for each media player. The system also supports the scheduling and display, in real time, of web pages and RSS feeds for ultimate flexibility. Please note there is a service fee associated with the re-issue of licences.